For use in all circumstances: a 3 in 1 parka that is waterproof, breathable and durable. All seams are taped. A clever system of leg snaps keeps the lower pockets open. Wide opening for the game pocket with its water repellent lining for easy cleaning. Its removable Thermotech inner vest provides the warmth required when position hunting and can be worn separately. 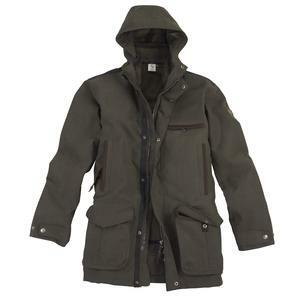 A decent dry and warm winter jacket with a good fit for size (2XL for 47" chest). Outer is like canvas but rustle free and well proofed. My main criticism is the sleeveless removable inner with arms not as warm as body. Freedom of movement is arguably a trade off for less restriction but in cold weather the correct choice of inner clothing will make a significant difference to overall warmth. I'm pleased with jacket and recommend it with the minor reservation of the less warm sleeves.